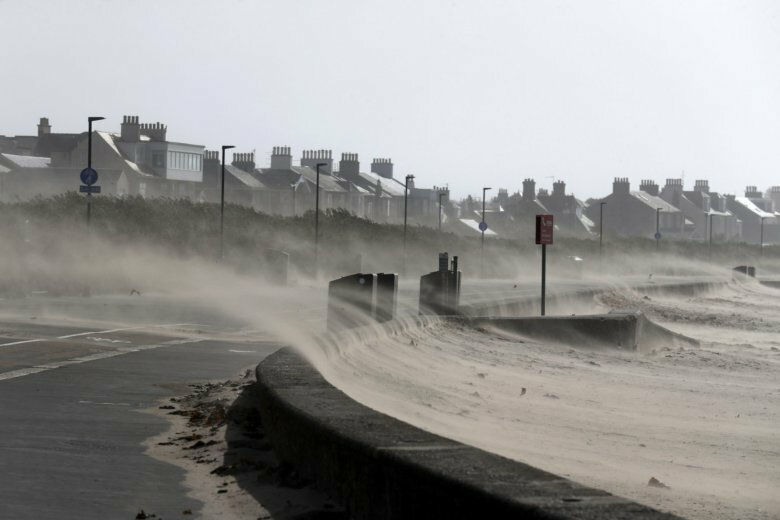 LONDON (AP) — A woman died after a caravan she was sleeping in was blown off a cliff on Wednesday as the British Isles were battered by a heavy storm. Irish police said the accident occurred in Galway County on Wednesday morning as rain and winds of over 60 miles per hour (97 kph) lashed Ireland and parts of Scotland and England. “A search was carried out at the scene on the beach and after a short time the body of a female in her 50s was recovered,” police said. The storm, which has been dubbed Ali, also left around 55,000 homes and businesses without power, mainly in the southwest of Ireland. The storm also caused disruptions to rail, road and ferry traffic across Scotland. In the Scottish capital, Edinburgh, a section of one of the main city thoroughfares, Princes Street, had to be closed after parts of a shop roof were torn off by the strong winds. In some places, winds of around 90 mph were recorded. British media also reported several cases of high winds toppling trees, in some cases onto cars.